The new top ten bestselling novel from the much loved author of 'Girl with a Pearl Earring'. Flames and funerals, circus feats and seduction, neighbours and nakedness: Tracy Chevalier's new novel 'Burning Bright' sparkles with drama. London 1792. The Kellaways move from familiar rural Dorset to the tumult of a cramped, unforgiving city. They are leaving behind a terrible loss, a blow that only a completely new life may soften. Against the backdrop of a city jittery over the increasingly bloody French Revolution, a surprising bond forms between Jem, the youngest Kellaway boy, and streetwise Londoner Maggie Butterfield. Their friendship takes a dramatic turn when they become entangled in the life of their neighbour, the printer, poet and radical, William Blake. He is a guiding spirit as Jem and Maggie navigate the unpredictable, exhilarating passage from innocence to experience. Their journey inspires one of Blake's most entrancing works. 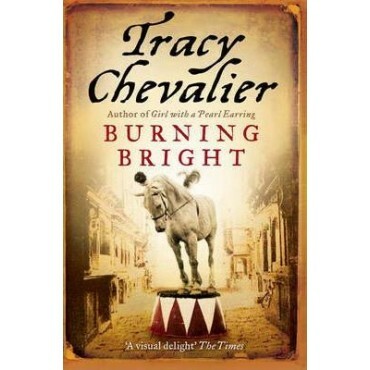 Georgian London is recreated as vividly in Burning Bright as 17th-century Delft was in Tracy Chevalier's bestselling masterpiece, Girl with a Pearl Earring.